The 10th anniversary iPhone X has become the focus of public for quite a long time. But there is still a long way to improve it, for instance, iPhone plays only MP4 and H.264 and Apple still doesn't add MKV into iPhone supported list. You cannot play MKV on iPhone natively. That's why a bevy of iOS MKV players catered to demanding users to watch MKV videos right on iPhone's high-resolution screen in high quality emerges. The MKV player for iPhone, such as VLC, AVPlayer, nPlayer, MCPlayer, etc, allows you to play MKV on iPhone without converting. But you have to bear in mind most of them neither support multiple audio track nor add soft subtitles to MKV, let along the annoying ads support and large space occupation on your iPhone. To get rid of all the shortages of MKV player for iPhone, here is a traditional but more reliable way - to decode and reencode MKV into iPhone supported formats like MP4 with a MKV video converter and then sync MKV to iPhone for playing later with iTunes. Rather than wasting iPhone space to download MKV player apps, MacX Video Converter Pro aids you to convert MKV to iPhone, with audio/video/subtitle tracks kept at blazingly fast speed. MKV editing and parameter adjusting are available too. Supported OS: Mac (High Sierra) and Windows (10). Supported iDevice: iPhone (X/8/7) and iPad (Pro/Air) or lower. 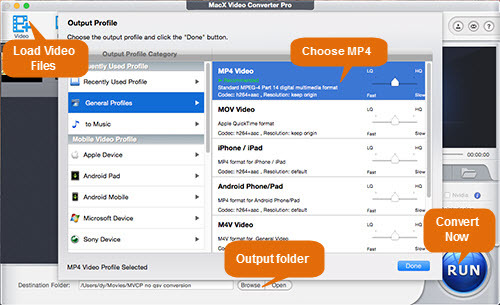 If hunting a good MKV converter for iPhone is time-wasting and annoying, you can turn to MacX Video Converter Pro. With a straightforward UI, it opens up a convenient way to complete the MKV transcoding task. With 370+ video/audio codecs, you can convert MKV, MTS, M2TS, AVCHD, MOD, AVI, H265, etc and make MKV playable on iPhone, iPad, Android, TV, PSP in a way more flexible. File size will be greatly reduced after the MKV to MP4 conversion, so that you can put MKV on iPhone without worrying about the large space occupation. This MKV converter for iPhone is well received for its easiness, fast speed and high quality, thanks to high-quality engine, hardware acceleration tech, multi-core CPU and hyper-threading technology. The MKV to iPhone conversion process is pretty simple, just follow the steps and then put MKV to iPhone for later playback. MacX Video Converter Pro is the best video converter for Mac and Windows that works well with Mac High Sierra or lower version. Its windows version is fully compatible with Windows 10. Just feel free to download it. Here we take convert MKV to iPhone on Mac as an example. Step 1: Free download MKV converter on Mac and open it. Click +Video button to load MKV file. It also supports adding multiple MKV videos at a time. Step 2: To play MKV on iPhone, you need to choose an output format that iPhone accepts such as MP4. Just click MP4 video (MPEG4 or H264) as the output format when the output profile window appears. Or you can directly choose iPhone model as per you needs from the Apple profiles. Its latest version enables you to directly convert MKV to iPhone X, iPhone 8 (Plus). Warm Prompt: For iPhone users worrying about space woe, you are advised to compress MKV file size beforehand by reducing the bitrate and resolution. Too much parameter lowering will leads to great quality loss. So we highly suggest you to lower the bitrate 20% smaller. Step 3: Set the output folder to save the MKV format and click RUN button to start MKV to iPhone MP4 conversion. Step 4: Open iTunes, click the converted MKV file, and transfer MKV to iPhone. After the transferring, you can play MKV on iPhone without any format issue. What is MKV: MKV is an open-source video file format that is widely used for storing movies and TV shows, mostly for its ability to hold multiple audio and video tracks, subtitles, chapters etc in a single file. Image quality in MKV is much higher than many other formats like WMV or AVI. If you can't play MKV on iPad, the no.1 fast MKV player for iPad - MacX Video Converter Pro will do the job for you by converting MKV and other files such as MTS, AVI, WMV, etc to iPhone MP4, MOV, M4V formats. Support the latest iPhone X, iPhone 8/7/6S/6 (Plus).